Oak, New York and By George, Austin. Joya's founder, Frederick Bouchardy, could only get his hands on 100 tins, so each package is individually stamped and numbered. 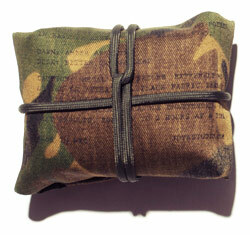 On a recent stop by the Baxter Finley barber shop, I spotted these cool camo packages in one of the cases. 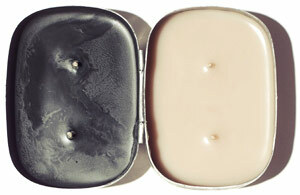 A two-in-one candle from New York-based fragrance house Joya, the double burner is housed in a vintage British Army soap case from the 1940s. One on side, you've got "dawn," a woody, leathery amber aroma and on the other, "dusk," which is a relaxing, herb and citrus based scent. I have something of a candle obsession, especially around this time of year, where without a fireplace, the flickering light thrown off by the flame and a hearty, campfire-tinged scent adds a subtle, rustic charm to my place. Joya's handsome metal case (ideal for travel) comes wrapped in traditional British camo that's been tailored to the size of a handkerchief. Consider it a free pocket square with purchase—or free gift wrapping if you're giving it as a gift.